Get ready cause Amigobingo.com will make your Birthday month even more special! Join the fun in the new Zodiac Star Sign Bingo event each month to celebrate each star sign! Once a month we will be celebrating the new Start Sign with an EXCLUSIVE $200 FREE ROLL EVENT for all depositors in that specific star sign! We will be sending out an email to players to notify them about this event, as it is an invitation only FREE ROLL that will be playing in a separate room. Every time you bingo on the Astrology pattern and it shows your star sign, send a CS ticket with the game ID and we will credit your account with an EXTRA $15BBs! Every first day of a new sign we are also hosting a FREE ROLL EVENT to all depositing players born in that sign. 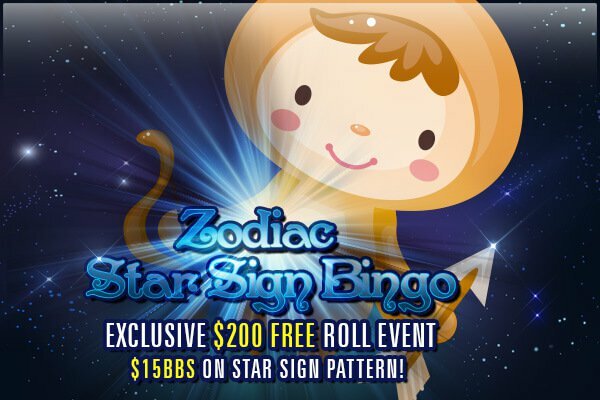 Every player born in that sign will receive a free bingo ticket to the “Exclusive Invitation Only $200 Star Sign Bingo Free Roll” which plays on the first night of that star sign at 8pm EST. This event will host 10 FREE games each carrying a $20BBS JP playing during the hour. To participate, make sure to deposit within 7 days before the event and we will add your name to the guest list! Don’t miss it! Not sure that your birth information is in your profile? Log into your account, go to your profile and update it now! This entry was posted in Blog on Dec 5, 2017 by Amigo Bingo.